Do you have someone in your life whose habits or personality force you to speak up for yourself? You know who I’m referring to because you can picture them now and you’re nodding your head in agreement. You prepare for interactions. You anticipate their next move and you might even rehearse conversations. You’ve gone to battle with them – in your head. Again and again, I’m reminded that the people who frustrate me most are the ones who have the most to teach me. Their behavior flashes like a mirror in the sunlight– and creates opportunities for self-reflection: to be more patient, more accepting, and more open. The loud reinforce the power of a softly spoken word. The needy give me pause to ponder my own needs and how I’m expressing them.. or not. The irresponsible prompt me to make more thoughtful choices. And the selfish serve as a reminder of what I don’t want to be. They’re in our way for a reason, I think. Sometimes I can see the lessons; other-times I fail to see them until years later. 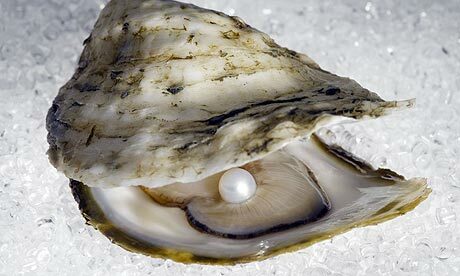 Remember … it takes the sand irritating the oyster to produce a pearl. Well……. I think a family member’s insistence to talk politics at EVERY given opportunity definitely teaches me patience! So true! I’ve noticed the people who grate me are actually just shining light on something about myself I don’t particularly like… so it’s a call and challenge to change myself and learn to love that other person, just the way they are. Love it. Needed this today! Same old, same old around here (work). Gheesh, it’s as if you read my mind. Thanks, MJ! So true! I also have learned alot from people who inspire me to be a better me, but that’s another post! Thanks for so regularly saying what I’m thinking! And how do you see inside my mind anyway?! Very wise words, my friend. So true. Thanks for sharing this, MJ!